ATLANTA, Nov. 26 /Christian Newswire/ -- Bob Roethlisberger was arrested and jailed over Thanksgiving weekend in a northern suburb of Atlanta, Georgia, on the charge of "Disorderly Conduct" for driving Operation Rescue's Truth Truck bearing signs with photos of aborted babies. The Truth Truck was impounded. Gwinnett County Police Department officers arrested Roethlisberger Saturday after telling him that signage on the Truth Truck was "vulgar and obscene." Officers ransacked the back of the Truth Truck without a warrant and ordered Roethlisberger to change or remove the signs. When he refused, he was arrested and incarcerated for three days before being released on $1,000 bond. The Truth Truck was released from impound late Monday, however the both the signs and the mounting hardware on the truck were damaged when police forcibly ripped the signs off the sides of the truck. Monetary damage to the property is estimated to be in the thousands of dollars. "It is obvious that these police officers, under the direction of Major Thomas Bardugon, engaged in a serious incident of unconstitutional content-based discrimination and illegal destruction of property," said Operation Rescue President Troy Newman. "Bob fully cooperated with officers, but refused to compromise on his message, which is unequivocally protected by the First Amendment. The officers misused their authority to punish Bob for expressing a viewpoint that ran counter to theirs. The arrest was nothing less than an egregious abuse of power." Newman discussed the matter with Major Bardugon who refused to drop the charges and threatened to arrest Newman if he drove the Truth Truck through Bardugon's jurisdiction. The Truth Truck was in Georgia because a recently introduced Human Life Amendment that is scheduled to be considered by the State Legislature in January. 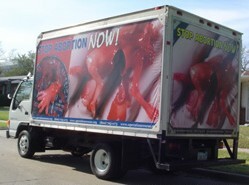 The Truth Truck's mission was to help draw the attention of Georgians to the reality that abortion brutally takes an innocent human life, and emphasize the need to ban the grisly procedure. "We intend to vigorously fight these unjust charges and will seek a remedy for our property loss," said Newman. "We cannot allow the illegal use of police authority to bully us into silence, when such silence could cost innocent human lives."